Every self published author sets out with some goal in mind as far as how many books he or she would like to sell in a given period of time. I’m no different. My first month has finally come and gone and I would now like to take the opportunity to give you all a little information about my first month goal and where my sales were relative to that goal. Let’s first start with my first month goal. Again, every author sets his or her own goal, so this may be very different from the next author. I wanted to sell 75 books my first month. And I was well on my way to that number early in November, but I ultimately fell a bit short. My final number as of writing this is 74. This includes my selling books in person, paperbacks on Amazon, and the Kindle version. Normally this might be a little disappointing. But you’ll recall that I had a day a couple of weeks ago in which the Kindle version of my book was free. Well I won’t include this number in my ‘sales’ pile, but I certainly keep it in mind. When I add in that day along with books that were given away to those who helped make the book possible my number now reaches 287. Which is quite fantastic if you ask me. My book is in the hands of 287 readers. And several being in the UK, Germany, Canada, and Italy. That’s just cool. So yes, I fell short of the first month goal I set for myself long before my book was released, but by no means was the first month a failure. And I’ll take a couple of books with me to work today to see if I can hopefully reach that 75. Wish me luck! Also, I’ve started work on the next chapter and will have that to share with you guys either tomorrow or Monday. Lastly, I had the opportunity to speak with someone working in law enforcement yesterday who loved my book! He was able to point out even the most minute details and could easily answer every question I had about his reading experience. I can honestly say that talking with him has been the best feeling I’ve experienced in my short time being a writer. Someone in law enforcement likes my detective story! Don’t take his word for it, make up your own mind! Take a look at the Amazon product page. I must first apologize to you guys. I just checked and realized that I hadn’t told you all about a new chapter since October 26. I’m sorry for that. Unfortunately I’ve been doing everything possible to get the word out about my first book, Divided Within, and I’ve fallen a bit behind schedule writing my second. That’s okay. The book will be written and you’ll soon be reading about Andrew and Sydney once again. I don’t have anything new to tell regarding my first book, so I’ll just go ahead and dive into the new chapter I’ve finally completed. As you probably don’t recall due to my lack of posting, Andrew Banks’ new client is a prominent activist. That’s what we learn in the opening chapter. The second gives him a chance to discuss the new client with Sydney. And now in the third he does more bouncing ideas off Sydney, but there is one interesting aspect of the chapter that I kinda sorta want to share with you guys. As you may or may not know from my posts or if you’ve gotten your hands on the book, Andrew and Sydney are approaching four years together. They’re both done with school and financially stable. So guess what they’re going to do?! Add to their small family! That’s all I’m saying for now! Also, for those of you who have gotten the book I’ll be posting a picture from Andrew’s office soon. So be on the lookout! AND the Kindle version of my book is permanently $0.99, so that’s reason enough to take a look at it if you haven’t already! AND you can get 30% off the price of my book on Amazon from now until Sunday by using promo code BOOKDEAL. What are you waiting for?! Last Chance! Divided Within Free Today Only! I posted early this morning that I was offering my book, Divided Within, FREE just for today. Well, it’s been wildly successful and I don’t want any of you to miss out! It’s currently ranked #1802 in the free Kindle store and rising! I would absolutely love for any or all of you to read my book and post a review on Amazon or let me know on here or on Twitter what you think. So, this is me putting my money where my mouth is. I didn’t set out to write my first book to make a ton of money, I did because I want to write stories forever and ever. And I want to share those stories with anyone who is interested. It’s currently ranked #9 < Kindle Store < Kindle eBooks <Mystery, Thriller & Suspense < Mystery < Hard-Boiled. It’d be grand to break into the top 1000 before the night’s over. Let’s make it happen! Click here to access the Amazon product page and get your hands on my book! My book will be free in the Kindle store for exactly six hours and forty-three minutes after this post is published! Don’t wait! FREE Kindle version of Divided Within Today Only! In an effort to get my book into the hands of as many readers as possible I have decided to offer the Kindle version of my book, Divided Within, for free! I really want some of you guys to read it and welcome feedback from any reader. So, all you have to do is go to the Amazon product page and download the free Kindle edition of my book and start reading! It couldn’t be much more simple. The offer expires at midnight tonight PacificTime, so don’t wait! All I want from you in return is a review on Amazon! I read those things! You can find free Kindle reading apps by clicking here. Also, I sold a book in Germany! I was pretty surprised when I found this in my sales report when it’s been so hard to get people who know me to buy my book. Maybe that one person in Germany will tell other people about it and get me a few more sales. Never know! And I finally started work on a new chapter yesterday that I’ll be discussing in my next post. Now that you’ve finished reading this post go get my free book! That’s right, folks, I’ve already scheduled my first nationwide tour to help promote my new book! I’ll of course be starting in my hometown of Houston, then I’ll have two stops in Arizona, one in California, one in Seattle, and then I’ll be flying cross country for two stops in New York and one in Washington DC and finish up in Miami. Isn’t that so exciting?! Well…it would be if it were true. Ha! I apologize to you if you believed every word of that. BUT I am going on a blog tour to help promote my book! AND I am excited! We’re still in the early early early planning stages so I don’t have much more information for you at this point. I’ll be sure to share any details with you guys as soon as I have them. It probably won’t start until the beginning of the year, so we have plenty of time to hash out the details. It should be between 15-20 blog stops and most will be reviewing my book. I’ll give you guys the necessary links later on in case any of you would like to participate! I also would like to talk about my current sales numbers. Before I released my book on October 29 I had a number in mind as to how many books I wanted to sell the first month. I’m happy to reveal to you all that I’m nearing my goal! I’m already more than two-thirds of the way there! Help me reach it! I know some of you have got to be just a little interested in my book. Only $2.99 on Kindle! Come on! Buy it, buy it, buy it! Take a look at the Amazon product page! And read the reviews! I’ve been promising you guys a post dedicated to my experience self publishing. Well, I’m finally going to make good on that promise. I’m going to go through all of the steps that it took for me to transform my manuscript into a book. The timeline will cover the entire book writing process, even before I began the self publishing process. So, let’s begin. Some of you have followed my blog since its inception at the start of June. For those of you who haven’t, now you know that the first chapter of my book, Divided Within, was written all the way back in May. This came less than two weeks after I walked across the stage at my university graduation ceremony. After pushing through almost three months of writing my first book and looking into the prospect of finding an agent to represent my work or self publishing, I’d decided to self publish my first book, for a number of reasons. But in deciding this I had to make a decision regarding which self publishing company I’d actually use. There are about a million out there and most have at least one benefit. I was still in the process of writing the first draft of my book, but I’d decided that CreateSpace was the way to go for me. On this lovely day down here in Texas when most college students were returning to school I’d managed to finally finish my first book. It was a remarkable feeling because there could be no more thoughts coursing through my head questioning whether or not I could do it, I’d done it! My beta readers actually received the second draft of my book. I’d already read through it once and made some necessary changes. The feedback was mostly positive and each reader sent me pages of notes to look over. This was when I first logged onto my CreateSpace account and began the publishing process. At this point in time I notified them that I would be purchasing a custom cover, interior design, Kindle conversion service, Library of Congress Control Number, and 500 bookmarks. The prices for these items is as follows: cover – $399, interior – $349, Kindle conversion – $79, LCCN – $49, bookmarks – $139. The grand total came to $1026 with tax. I didn’t pay this on this date. I’m sure some of you are wondering why in the world would I pay a thousand dollars to publish my book. Well, these services are not required to use CreateSpace. An author can do everything his or her self and pay nothing. At this point in time I wanted my book to be as professional as possible. The woman I spoke with was both friendly and knowledgeable. I had a list of questions that she was able to answer without hesitation. We discussed all of the above services I’ve mentioned and this was the first time I learned that I’d be receiving twenty complimentary copies of my book with my order. I was surprised and happy that I’d get to give the people who helped my book make it this far a free copy. I was unprepared at this point to pay and we settled for my paying the next business day. I paid the full $1026 at that time. This first consultation with my design team was meant to give me the opportunity to discuss exactly what I wanted done with my book. The major topics would include the cover design and the interior formatting. But by this point I’d decided to use their free cover generator instead of having them design the cover for me. I told this to the person I spoke with and she told me that based on my responses to the cover questionnaire that she thought it was a good decision made by me. The covers that I’d mentioned were not highly complex and I felt I could easily come up with something using the free cover creator that I would be proud of. She immediately issued the refund for the cover service of $399. I’d prepared for the other services and we quickly decided the interior formatting and the bookmarks. The entire call took about fifteen minutes when they’re typically well over an hour according to the person I spoke with. This was remarkably fast. They had given me a two week window in which they would be working on my interior formatting and had it ready only five days after the consultation with the design team. I was greatly impressed. I took this opportunity to read all the way through my book for the third and final time. In doing so I found somewhere around 35 errors that needed fixing. CreateSpace allows for up to 200 textual changes after the initial interior is complete, so I was well within that threshold. I made the necessary corrections within a Word document they provide and sent the manuscript back. This is where it gets a little rocky. Just a little. I received what I hoped would be my final proof of the book, but there was a problem. Not a single one of my changes was actually made. This leads me to believe that no one ever actually looked at it before sending it back to me. I was upset, but let me be clear, by no means do I think this was done on purpose or in negligence. I know that CreateSpace publishes a great many books each year and mine was not the only one being worked on at the time. I called the support number and she expressed concern as to how this happened and agreed to have my changes made within three business days because I’d already had to wait for it. True to her word, I received my final digital proof on that third business day and every mistake I’d corrected was in fact corrected. I jumped for joy. I was incredibly excited because I thought my book was all set to be released at the click of a button. But no, I’d also be receiving a physical proof. The celebration had to wait just a little while longer. I received my author proof and almost cried when I had it in my hands. I’d read countless forum discussions and posts discussing the quality of the books printed. In some cases as much as half the order was said to be damaged. But my book was perfect. Absolutely perfect. I logged onto my CreateSpace account and my book was officially released. The CreateSpace website told me that the Amazon product page would be online within 5-7 business days of my book’s release. Well, like every other timeline they gave me this one was very generous in its time frame. I woke the next morning to the sound of thunder outside my window and found my Amazon product page to be up and running. I was ecstatic. The world finally had the opportunity to read MY book! The Kindle edition was said to be released within fifteen business days of the release of the print edition of my book. Well, again CreateSpace outdid itself and got it online within eight total days. My first book signing took place on the campus of the University of Houston Downtown, where I graduated from in May. They were holding a criminal justice majors day, which was my degree, and invited me back. I’d only been given a two day notice and had to scramble to make a display, but I did and the signing was overwhelmingly successful. I was able to sell 21 of the 25 books I took with me with a number of students and professors expressing great pride in the fact that a UHD alum had written a book so soon after graduation. The order of bookmarks that I’d originally placed was refunded because they still had not begun work on them and I didn’t want to wait any longer. Bookmarks are really more of a perk than anything, so I decided to order some business cards instead to give out at signings and events so that people knew how to get in contact with me. If I had to rate my experience with CreateSpace I would probably give it a 97%. You’re probably thinking about the issues that I described above as lowering the score far more than three percentage points, but I don’t think so. The issue with the interior was quickly resolved and the bookmarks were never a necessity. Every timeline I was given for a service to be completed was easily met and every person I talked to over the phone was able to quickly answer any questions I had. CreateSpace allowed me to price the book fairly, whereas other self publishers force the author to price high in order to make any money. The books printed are no lower quality than what you might find from a traditional publisher. The total cost ended up at $477. And the books are sold to me from CreateSpace at only the cost of printing, which is very low. I would absolutely recommend CreateSpace to any author looking to self publish. Keep in mind that I only discussed the services I used. They offer editing, marketing materials such as posters, business cards, and postcards. They offer the free cover creator or a cover design service. I hope any reader of this post feels a bit more knowledgeable about the self publishing process with CreateSpace! If you’d like to see their work for yourself, then buy my book! It’s available in print and on Kindle! The Amazon page can be accessed here. Answering a Question I’m Often Asked: How did you actually write the book? I posted last week about my successful first signing on the campus of my alma mater. I managed to sell 21 of the 25 books I took with me and discussed how great the overall experience was for me. Well, I was asked many questions by students and faculty alike and I’d like to take the opportunity to answer the single most asked question of me. Remember this was being asked by college students who often express frustration with writing a very short essay on a topic that is likely uninteresting to them. My response was never the same because each time the question was asked by someone with a different point of view on things and with the intent to learn something different from the previous person. But let me see if I can answer it once and for all. The one thing I told several people was that you’re always told that to be a good a writer or a writer at all that you have to write. And by this it is often meant that you have to write each and every day. I’ve mentioned in several previous posts that I simply don’t believe in this philosophy one bit. If you are forcing yourself to write even when your creative juices seem to be at a stand still, then what exactly are you accomplishing? I’ll tell you, you’re putting bad writing on paper that you’ll have to later edit or remove completely. How does that help you achieve your writing goal? It doesn’t. My logic is to treat each individual chapter as if it were a college paper. My longest in school was only nine pages and my longest chapter in my first book was fourteen, but most are well within the length of a regular college essay. Doing this allowed for me to focus on a very particular part of the story and sequence of events rather than have me think of where I’d take the characters several chapters down the road. This writing philosophy allowed time for me to perfect a small portion of the story before moving on to the next small portion. Another aspect of the same question I was asked during my first signing was what I thought of the process to write a book, whether or not I liked it. This question was a bit more complicated for me to answer. You see, during my last semester of school this past spring I was terrified of the prospect of writing an entire book. I was. I can remember specifically in April becoming incredibly anxious as the semester was winding down to a close. I was scared of not being able to do it. This was all I’d thought about for more than a year and the thoughts that were coursing through my head were beginning to become more and more real because it was coming time to put up or shut up. Thankfully I was able to put those feelings aside and write me a novel. But here’s how I answered this particular question. I didn’t enjoy the book writing process as much as I’d hoped. I love the story I wrote and the characters I created, but the process to get to this point was pretty rocky. I went weeks at a time without putting a single word on paper and faced holes in the story that I struggled to overcome. I had no idea how the story would end until I reached the last third of the book. And the final major obstacle I faced was getting people wanting to read it. I don’t mean potential readers, I mean people I know on a personal level. I mentioned several posts ago that I sent my book out to nine beta readers and only four actually read it. This is now what’s happening to me trying to get people to buy it. Which is perfectly fine, but also disappointing. BUT I managed to finish the book and prove to people that I wasn’t just talking about writing a book, I’ve written one! Don’t forget that my book is also on Kindle for only $2.99 and is part of the Kindle Owners’ Lending Library that allows Prime members with a Kindle the opportunity to borrow the book for free! Take a look at the Amazon product page! 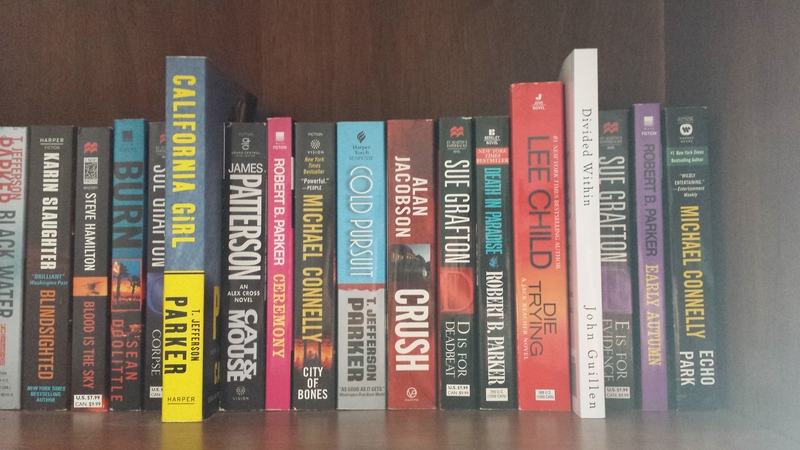 In other news, check out where my book sits on my bookshelf. Right between Edgar award winners and New York Times Bestsellers!